Glen Melvin Mollet was born on 9 March 1917 at Lake Andes, Charles Mix, South Dakota. Glen Melvin Mollet married Ruth Lorraine Olson, daughter of Edwin G. Olson and Olive (? ), on 17 October 1940 at Hopkins, Minnesota, also reported as Milaca, Minnesota. Glen Melvin Mollet died on 14 November 1994 at Bella Vista, Benton, Arkansas, at age 77. He was buried after 14 November 1994 at Fort Snelling National Cemetery, Minneapolis, Hennepin, Minnesota, Plot: 3, 0, 498. 1925 South Dakota Glen Melvin Mollet appeared on the census of 1925 in the household of Charles August Mollet at South Dakota. 1935 White Swan, Charles Mix, South Dakota Glen Melvin Mollet appeared on the census of 1935 at White Swan, Charles Mix, South Dakota. Release Date 1: 22 Aug 1946. Married Name 17 October 1940 As of 17 October 1940,her married name was Mollet. Ruth Lorraine Olson was born on 17 October 1918 at Fairbault, Rice, Minnesota. She was the daughter of Edwin G. Olson and Olive (?). Ruth Lorraine Olson married Glen Melvin Mollet, son of Charles August Mollet and Nellie Cecelia Carlson, on 17 October 1940 at Hopkins, Minnesota, also reported as Milaca, Minnesota. Ruth Lorraine Olson died on 28 January 2010 at age 91 Mollet, Ruth L. age 91, passed away January 28, 2010. Preceded in death by parents, husband, Glen; brother Roy; sisters, Doris and Betty. Survived by daughter, Karen (Dean); grandchildren Carma Hall (Scott) and Trent Jaeger (Carrie); great-grandchildren Christopher, Madeleine and Michael Hall; Isabel, Hanna and Lilly Jaeger; brother Bob Olson and sister Irene Thunstrom; nieces, nephews and friends. Services Friday, February 12, 2010 at 11 AM, Washburn-McReavy Edina Chapel, W. 50th St. & Hwy 100. Visitation one hour prior to service. Burial at Fort Snelling National Cemetery. She was buried after 28 January 2010 at Fort Snelling National Cemetery, Minneapolis, Hennepin, Minnesota, Plot: 3, 498. 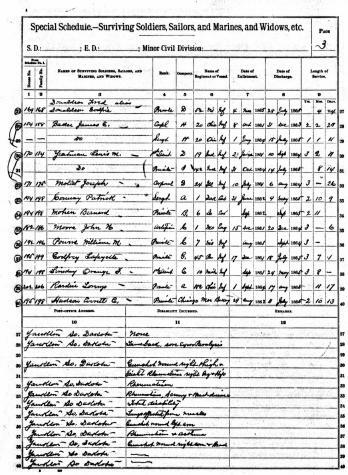 [S243] U.S. Federal Census 1920 U.S. Federal Census, by Ancestry.com, Year: 1920; Census Place: Minneapolis Ward 7, Hennepin, Minnesota; Roll: T625_835; Page: 16B; Enumeration District: 130; Image: 566. 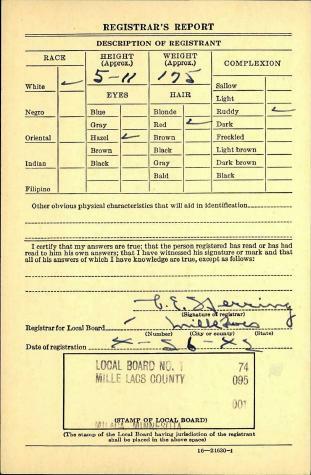 [S250] U.S. Federal Census 1930 U.S. Federal Census, by Ancestry.com, Year: 1930; Census Place: Page, Mille Lacs, Minnesota; Roll: 1107; Page: 4A; Enumeration District: 20; Image: 717.0. Edna M. Mollet was the daughter of Charles August Mollet and Nellie Cecelia Carlson. Edna M. Mollet died at died in infancy. Ida M. Mollet was the daughter of Charles August Mollet and Nellie Cecelia Carlson. Ida M. Mollet died at died in infancy. 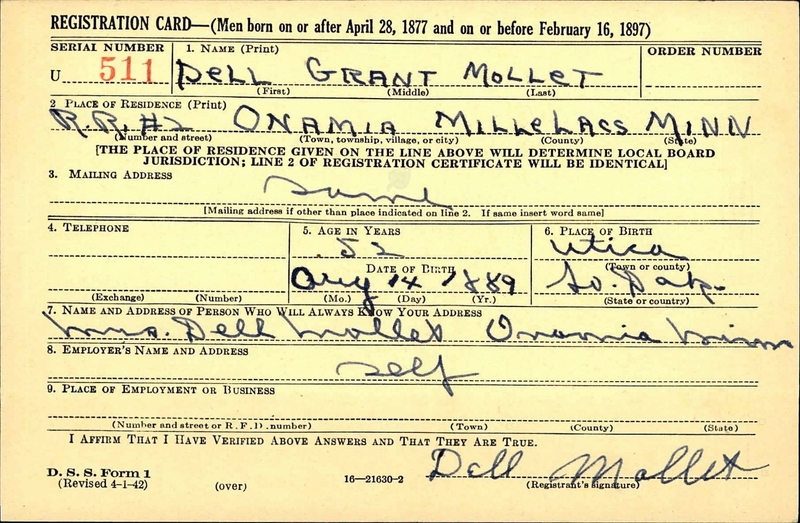 Name Variation Delbert Grant Mollet was also known as Dell Grant. 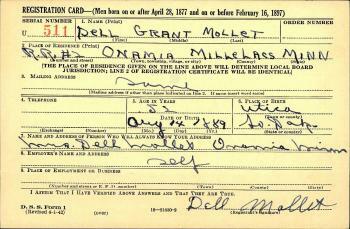 Delbert Grant Mollet was born on 14 August 1889 at Utica, Yankton, South Dakota. Delbert Grant Mollet married Birdie A. McIntire, daughter of Mahlon Alonzo McIntire and Laura Bell Thisell, circa 1910. Delbert Grant Mollet witnessed the baptism of Agnes Charlotte Mollet on 6 May 1917 at First Lutheran Church, Lake Andes, Charles Mix, South Dakota. Delbert Grant Mollet died on 5 September 1979 at Marion, Oregon, at age 90 Delbert B. Mollet, 90, 916 N. Birch St., died Wednesday in a Salem hospital after an extended illiness. He was born in Utica, S. D. He came to Oregon in 1948 from Minnesota. He was a retired farmer. He is survived by daughters, Agnes Anderson, Salem, and Vivian Johnson, Braham, Minn; brother [son], Wayne, Milaca, Minn., 12 grandchildren and 32 great-grandchildren. He was buried after 5 September 1979 at Fox Valley Cemetery, Lyons, Linn, Oregon. 1915 South Dakota Delbert Grant Mollet appeared on the census of 1915 at South Dakota. Delbert Grant Mollet obtained US Social Security Card at Minnesota; last residence Salem, Marion, Oregon. He witnessed the adoption of Oliver Mollet after May 1910. 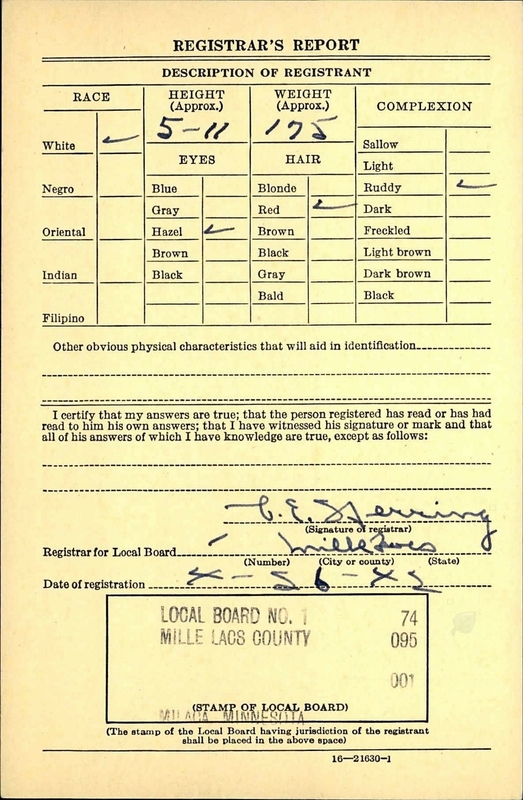 On 26 April 1942 at WWII Registration, South Dakota. [S272] Oregon Death Index, 1903-98 (published), Certificate: 79-14660. [S244] U.S. Federal Census 1910 U.S. Federal Census, by Ancestry.com, ED 93. Sheet 9A. Stamp 170. Dwelling 146. [S243] U.S. Federal Census 1920 U.S. Federal Census, by Ancestry.com, ED 53. Sheet 1B. Dwelling 15. [S250] U.S. Federal Census 1930 U.S. Federal Census, by Ancestry.com, ED48-14. Dwelling 151. [S373] U.S. Federal Census 1940 U.S. Federal Census, by Ancestry.com, Year: 1940; Census Place: South Harbor, Mille Lacs, Minnesota; Roll: T627_1938; Page: 3A; Enumeration District: 48-25. Married Name circa 1910 As of circa 1910,her married name was Mollet. Birdie A. McIntire was born in January 1893 at South Dakota. She was the daughter of Mahlon Alonzo McIntire and Laura Bell Thisell. Birdie A. McIntire married Delbert Grant Mollet, son of John J. Mollet and Caroline L. Peter, circa 1910. Birdie A. McIntire witnessed the baptism of Agnes Charlotte Mollet on 6 May 1917 at First Lutheran Church, Lake Andes, Charles Mix, South Dakota. Birdie A. McIntire died in January 1949 at Stayton, Marion, Oregon. 1915 South Dakota Birdie A. McIntire appeared on the census of 1915 in the household of Delbert Grant Mollet at South Dakota. 1925 South Dakota Birdie A. McIntire appeared on the census of 1925 in the household of Delbert Grant Mollet at South Dakota. Birdie A. McIntire witnessed the adoption of Oliver Mollet after May 1910. [S245] U.S. Federal Census 1900 U.S. Federal Census, by Ancestry.com, ED139. Dwelling 80. [S244] U.S. Federal Census 1910 U.S. Federal Census, by Ancestry.com, ED96. Dwelling 99. Married Name before 1934 As of before 1934,her married name was Anderson. Agnes Charlotte Mollet was born on 17 November 1916 at South Dakota also reported as 17 Dec 1915. She was the daughter of Delbert Grant Mollet and Birdie A. McIntire. Agnes Charlotte Mollet was baptized on 6 May 1917 at First Lutheran Church, Lake Andes, Charles Mix, South Dakota. She married Joseph Benjamin Anderson, son of Peter Nels Anderson and Anna Stromberg, before 1934 at Stayton, Marion, Oregon. Agnes Charlotte Mollet died on 4 December 1995 at Oregon at age 79. 1925 South Dakota Agnes Charlotte Mollet appeared on the census of 1925 in the household of Delbert Grant Mollet at South Dakota. [S373] U.S. Federal Census 1940 U.S. Federal Census, by Ancestry.com, Year: 1940; Census Place: Milaca, Mille Lacs, Minnesota; Roll: T627_1938; Page: 3B; Enumeration District: 48-14A. Name Variation Joseph Benjamin Anderson was also known as Joe B.
Joseph Benjamin Anderson was born on 14 December 1897 at Minnesota. He was the son of Peter Nels Anderson and Anna Stromberg. Joseph Benjamin Anderson married Agnes Charlotte Mollet, daughter of Delbert Grant Mollet and Birdie A. McIntire, before 1934 at Stayton, Marion, Oregon. Joseph Benjamin Anderson died on 25 October 1966 at Oregon at age 68. [S245] U.S. Federal Census 1900 U.S. Federal Census, by Ancestry.com, Year: 1900; Census Place: Whitefield, Kandiyohi, Minnesota; Roll: 772; Page: 2A; Enumeration District: 0069; FHL microfilm: 1240772. [S244] U.S. Federal Census 1910 U.S. Federal Census, by Ancestry.com, Year: 1910; Census Place: Milo, Mille Lacs, Minnesota; Roll: T624_711; Page: 7A; Enumeration District: 0106; FHL microfilm: 1374724. Edith Mollet was the daughter of Delbert Grant Mollet and Birdie A. McIntire. Edith Mollet died at died in infancy. Married Name Her married name was Swanson. Vivian Lucille Mollet married Alfred Waldemar Swanson at Cambridge, Minnesota. Vivian Lucille Mollet was born on 26 June 1921 at Lake Andes, South Dakota. Vivian Lucille Mollet died on 25 August 1998 at Braham, Isanti, Minnesota, at age 77. Alfred Waldemar Swanson married Vivian Lucille Mollet, daughter of Delbert Grant Mollet and Birdie A. McIntire, at Cambridge, Minnesota. Alfred Waldemar Swanson was born on 12 May 1916 at Minneapolis, Hennepin, Minnesota. [S329] Minnesota Death Index, 1908-2002 (published), State File Number: 2001-MN-508192. Wayne Delbert Mollet was born on 4 February 1924 at South Dakota. He was the son of Delbert Grant Mollet and Birdie A. McIntire. Wayne Delbert Mollet married Doris Mildred Heim, daughter of John Heim and Anna J. Kleppe, on 8 August 1948 at Milica, Minnesota. Wayne Delbert Mollet died on 10 December 2006 at age 82 Wayne D. Mollet, 82, of Bock died Sunday, Dec. 10, 2006 at Fairview Northland Regional Hospital in Princeton. Funeral services will be held Friday, Dec. 15 at 11 a.m. at the Emanuel Lutheran Church in Bock, with the Rev. Julie Smith officiating. Burial will be in the Borgholm Cemetery in Bock. Visitation will be today (Thursday) from 5 to 8 p.m. at the Peterson-Johnson Funeral Home in Milaca. Pallbearers will be grandsons; Tim, Rod Jr., Del, David and Kirk Mollet and Matt Cagle. Honorary pallbearers will be granddaughters; DeAnna, Kristine and Kendra Mollet, Sheila and Tammy Dohanick, Shannah Mollet-Kreller, Stephanie Mattila and Jenny Olson. Military honors will be provided by Hansen-Hayes American Legion Post 178 and Siemers-Hakes VFW Post 10794. Wayne was born Feb. 4, 1924 in Lake Andes, S.D. to Delbert and Birdie (McIntire) Mollet. When Wayne was three years old, they moved to the Milaca area where Wayne attended local country schools. Wayne married Doris Heim on Aug. 8, 1948 in Ogilvie. The couple farmed north of Bock where they raised five children. Wayne worked for Orin Thompson Homes for 30 years as a cement finisher. In later years, he drove van for the Milaca DAC. He loved to pitch horseshoes, shoot pool, and fish. He was envied for his vegetable and flower gardens. He enjoyed traveling and sightseeing with his family. Wayne was an avid Twins fan and enjoyed watching his children and grandchildren play softball over the years. Wayne was a member of the Emanuel Lutheran Church in Bock where he served on the church council. He also served on the Borgholm Township Board. 1925 South Dakota Wayne Delbert Mollet appeared on the census of 1925 in the household of Delbert Grant Mollet at South Dakota. Married Name 8 August 1948 As of 8 August 1948,her married name was Mollet. Doris Mildred Heim was born on 31 December 1926 at North Dakota. Doris Mildred Heim married Wayne Delbert Mollet, son of Delbert Grant Mollet and Birdie A. McIntire, on 8 August 1948 at Milica, Minnesota. Doris Mildred Heim died on 7 March 2012 at age 85 Funeral services for Doris M. Mollet, age 85, of Milaca, will be held Saturday, March 10, 2012 at 11 AM at Emanuel Lutheran Church in Bock with Rev. Beverly Robinson officiating. Interment will follow at Borgholm Cemetery near Bock. Visitation will be from 5 to 8 PM Friday at Peterson-Johnson Funeral Home in Milaca and 1 hour prior to the service at the church on Saturday. Music will be provided by Cheryl Bailey and Austin Karas. Casketbearers will be her grandsons, Tim Mollet, Rod Mollet, Jr., Del Mollet, Matt Cagle, Dave Mollet and Kirk Mollet. Honorary casketbearers will be her granddaughters, Shannah Mollet-Kreller, Sheila Dohanick, Stephanie Mattila, Deanna Fradette, Tammy Quinn, Kristine Mollet, Jenny Olson and Kendra Mollet. Arr. Peterson-Johnson Funeral Home of Milaca. Doris Mildred Mollet was born December 31, 1926 in Lignite, ND to John and Anna (Kleppe) Heim. As a young girl, she moved with her family to Ogilvie, MN. She was united in marriage to Wayne Mollet on August 8, 1948 in Ogilvie, MN. The couple farmed north of Bock where they raised their five children. Doris was a homemaker and farm wife. She enjoyed caring for her children and grandchildren. Doris took great pride in her cooking, her flower gardens and canning. She also loved music. Doris was a member of the Emanuel Lutheran Church in Bock where she was active in church circles and sang in the church choir. She was also a member of the VFW Ladies Auxiliary. Wayne and Doris sold the farm in 2006 and moved to Country Meadows Assisted Living in Milaca. She died on Wednesday, March 7, 2012 at the Milaca Elim Home. She is survived by children, Lola Rae (Wally) Dohanick of Milaca, Darrell (Pauline) Mollet of Milaca, Rodney (Carol) Mollet of Dassel, LuAnn (Robert) Olson of Ramsey, and Myron (Carol) Mollet of Milaca; 14 grandchildren; 16 great-grandchildren; sister, Cleone Fokken of Milaca; brothers, Gordon (Helen) Heim of Mora and Lyle (Julie) Heim of Little Rock, AK; sister-in-law, Pietje Heim of Rochester, MN; also by many nieces, nephews, other relatives and friends. She was preceded in death by her parents; husband, Wayne in 2006; sister, Marian Strathe and brothers, Julian Heim and Roy Heim. 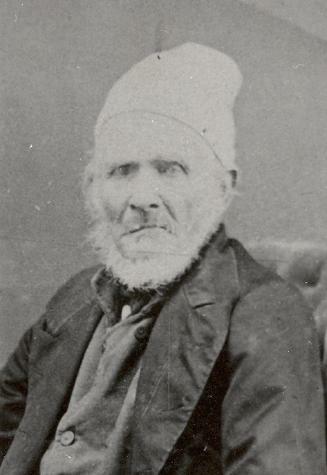 Benedict Mollet was born on 6 May 1813 at Unterramsern, Aetingen (now Bucheggberg), Solothurn, Switzerland. He was the son of Nicklaus Mollet and Maria Von Ballmoos. Benedict Mollet married Elizabeth Muehlinman, daughter of Andreas Muehlinman and Anna Hugi, on 8 March 1839 at Solothurn, Switzerland. Benedict Mollet was buried in 1878 at Highland Cemetery, Highland, Madison, Illinois. He died in 1878 at Highland, Madison, Illinois. 3 July 1855 Township 3 Range 5, Madison, Illinois Benedict Mollet appeared on the census of 3 July 1855 at Township 3 Range 5, Madison, Illinois, listed as B Mollet; household includes 11 people (6 male, 5 female); value of livestock listed as 400 dollars. Benedict Mollet and Elizabeth Muehlinman immigrated in 1853 After a sea voyage of about 3 months, they landed in N. Y. City, where they were robbed of their baggage. Benedict Mollet migrated in 1854 at Helvetia, Madison, Illinois. Name Variation Elizabeth Muehlinman was also known as Muehlemann. Married Name 8 March 1839 As of 8 March 1839,her married name was Mollet. Elizabeth Muehlinman was born on 20 February 1815 at Batterkinden, Solothurn, Switzerland. She was the daughter of Andreas Muehlinman and Anna Hugi. Elizabeth Muehlinman married Benedict Mollet, son of Nicklaus Mollet and Maria Von Ballmoos, on 8 March 1839 at Solothurn, Switzerland. Elizabeth Muehlinman died on 13 January 1869 at from pneumonia, Highland, Madison, Illinois, at age 53. She was buried after 13 January 1869 at Highland Cemetery, Highland, Madison, Illinois. 3 July 1855 Township 3 Range 5, Madison, Illinois Elizabeth Muehlinman appeared on the census of 3 July 1855 in the household of Benedict Mollet at Township 3 Range 5, Madison, Illinois; listed as B Mollet; household includes 11 people (6 male, 5 female); value of livestock listed as 400 dollars. Elizabeth Muehlinman and Benedict Mollet immigrated in 1853 After a sea voyage of about 3 months, they landed in N. Y. City, where they were robbed of their baggage. Elizabeth Muehlinman migrated in 1854 at Helvetia, Madison, Illinois. Joseph Gotthardt Mollet Sr. was born on 4 August 1839 at Solothurn, Canton, Switzerland, also listed as Czech. Republic. Joseph Gotthardt Mollet Sr. married Mary Peter, daughter of Conrad Frank Peters and Maria (? ), on 12 December 1865 at Chicago, Cook, Illinois. Joseph Gotthardt Mollet Sr. died on 7 February 1924 at Stratford, Hamilton, Iowa, at age 84. He was buried after 7 February 1924 at Pleasant Lawn Cemetery, Geddes, Charles Mix, South Dakota. 3 July 1855 Township 3 Range 5, Madison, Illinois Joseph Gotthardt Mollet Sr. appeared on the census of 3 July 1855 in the household of Benedict Mollet at Township 3 Range 5, Madison, Illinois; listed as B Mollet; household includes 11 people (6 male, 5 female); value of livestock listed as 400 dollars. Years in United States: 53. Rank: Corporal. He ended military service in 1864 at South Dakota; Corporal - Civil War 1861-1864 - disability incurred rheumatisis. He lived in 1900 at 314 Phoenix, Yankton, Yankton County, South Dakota. He was employed by In the 1900 census, Joseph Mollet's occupation was carpenter. on 16 June 1900 at Yankton, Yankton County, South Dakota. [S186] Illinois, Illinois Statewide Marriage Index, vol 6 page 199 license 979. [S246] U.S. Federal Census 1880 U.S. Federal Census, by Ancestry.com, stamp 455B. Page 323. Dwelling 225. [S245] U.S. Federal Census 1900 U.S. Federal Census, by Ancestry.com, ED 348. Sheet 19B. Dwelling 247. [S244] U.S. Federal Census 1910 U.S. Federal Census, by Ancestry.com, ED440. Stamp 113. Dwelling 265. [S243] U.S. Federal Census 1920 U.S. Federal Census, by Ancestry.com, ED267. Dwelling 103. Name Variation Mary Peter was also known as Peters. Married Name 12 December 1865 As of 12 December 1865,her married name was Mollet. Mary Peter was born on 23 December 1846 at ship "Therese" coming from Germany to New Orleans, Louisiana, also reported as ship "Ocean Shire." She was the daughter of Conrad Frank Peters and Maria (?). Mary Peter married Joseph Gotthardt Mollet Sr., son of Benedict Mollet and Elizabeth Muehlinman, on 12 December 1865 at Chicago, Cook, Illinois. Mary Peter died on 7 September 1910 at Yankton, Yankton County, South Dakota, at age 63. She was buried after 7 September 1910 at Pleasant Lawn Cemetery, Geddes, Charles Mix, South Dakota. heading for St. Louis, Missouri. Children of Mary Peter and Joseph Gotthardt Mollet Sr.
[S248] U.S. Federal Census 1860 U.S. Federal Census, by Ancestry.com, Page 167. Dwelling 1175. Name Variation Caroline M. Mollet was also known as Carrie. Married Name 25 March 1899 As of 25 March 1899,her married name was Krider. Caroline M. Mollet was born on 8 October 1866 at Highland, Madison, Illinois. She was the daughter of Joseph Gotthardt Mollet Sr. and Mary Peter. Caroline M. Mollet married Charles Krider on 25 March 1899. Caroline M. Mollet died on 10 March 1939 at Jones, South Dakota, at age 72. She was buried after 10 March 1939 at Murdo Cemetery, Murdo, Jones, South Dakota. Caroline M. Mollet had zero children. [S243] U.S. Federal Census 1920 U.S. Federal Census, by Ancestry.com, ED10. Dwelling 25. [S250] U.S. Federal Census 1930 U.S. Federal Census, by Ancestry.com, Year: 1930; Census Place: Okaton, Jones, South Dakota; Roll: 2225; Page: 3B; Enumeration District: 17; Image: 518.0. Charles Krider was born on 19 February 1876 at Iowa or Indiana also reported as 1874. He married Caroline M. Mollet, daughter of Joseph Gotthardt Mollet Sr. and Mary Peter, on 25 March 1899. Charles Krider died after 1930. Circa 1918 at WWI Civilian Draft Registration, Bon Homme, South Dakota. Name Variation Elizabeth Mollet was also known as Lizzie. Name Variation Elizabeth Mollet was also known as Mollett. Married Name 2 November 1887 As of 2 November 1887,her married name was Hook. Married Name 4 April 1923 As of 4 April 1923,her married name was Walstrom. Elizabeth Mollet was born on 4 November 1868 at Highland, Madison, Illinois, also reported as South Dakota. Elizabeth Mollet married David Westly Hook on 2 November 1887 at Yankton, Yankton County, South Dakota. Elizabeth Mollet and David Westly Hook were divorced on 12 October 1916. Elizabeth Mollet married Jonas H. Walstrom, son of John E. Walstrom and Hilena Lundgren, on 4 April 1923. 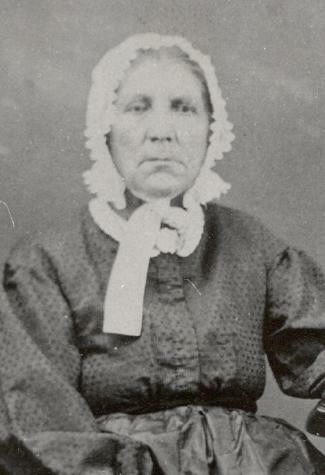 Elizabeth Mollet died on 17 January 1953 at Cedar Rapids, Linn, Iowa, at age 84 Mrs. Elizabeth Walstrom, a pioneer settler of Hook's Point and a resident of Stratford for many years, passed away in the home of her daughter, Mrs. M.B. Geesey, at Cedar Rapids, Iowa, Jan. 17, 1953, at 10:55 p.m., at the age of 84 years, 2 months and 13 days. She had been in failing health for some time and submitted to three major operations within the last two years. Regardless of her own misery, she always found time to do for others, and thoughts of others were foremost in her mind. Mrs. Walstrom was born at Highland, Ill., and when a small child traveled by covered wagon with her parents, Joseph and Mary Mollet, to South Dakota, where the family homesteaded. In 1887 she was united in marriage to David Wesley Hook, who preceded her in death as did two daughters, Mrs. A. J. Towlerton (Laura) and Mrs. George W. Sellers (Bertha), and four grandchildren. She was united in marriage to Jones Walstrom who also preceded her in death June 14, 1942 and three step-children, George and John Walstrom and Mrs. Anna Stephens. 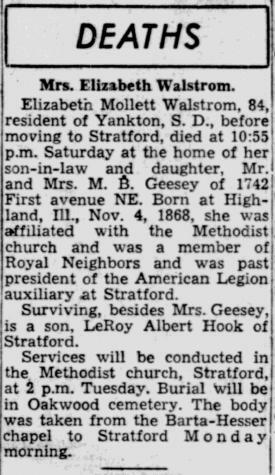 She leaves to mourn her passing; a son, Roy, of Stratford; Mrs. Isabell Geesey of Cedar Rapids; five grandchildren; Julius Hook of Stratford, Marvin and Donald Hook of Denver, Colo., Jane Warden of Cedar Rapids, Lois Frees of Minneapolis, four step-grandchildren, three great grandchildren, besides a host of friends and neighbors. Mrs. Walstrom was especially interested in church and Auxilary work and in the local Royal Neighbor Lodge. Funeral services were held from Calvary Methodist church in Stratford Jan. 20, 1953, at 2 p.m., following a brief prayer service in the home, with Rev. Otto S. Steele, Jr., officiating. Three vocal selections were sung by Mrs. Otto Steele; "The Old Rugged Cross", "Abide With Me", and "Let Not Your Heart Be Troubled." She was accompanied by Mrs. Ronald Bell at the organ. Flowers were in charge of Mrs. Clarence Johnson, Mrs. Weldon Swedlund and Mrs. Lloyd Ulrick. A Legion Auxiliary service was conducted by Mrs. Ruby Hubner and Mrs. Carl Sackrison. Interment was in Oakwood cemetery. Pallbearers were: M.C.Carlson, I. L. Chally, R. J. Gustafson, Carl Johnson, Julius Johnson and Basil Williams. She was buried on 20 January 1953 at Oakwood Cemetery, Stratford, Hamilton, Iowa. 1 January 1925 Stratford, Hamilton, Iowa Elizabeth Mollet is listed as wife on the census of 1 January 1925 in the household of Jonas H. Walstrom at Stratford, Hamilton, Iowa. [S250] U.S. Federal Census 1930 U.S. Federal Census, by Ancestry.com, ED40-22. Dwelling. David Westly Hook was born on 20 July 1863 at Indianapolis, Marion, Indiana. He married Elizabeth Mollet, daughter of Joseph Gotthardt Mollet Sr. and Mary Peter, on 2 November 1887 at Yankton, Yankton County, South Dakota. David Westly Hook and Elizabeth Mollet were divorced on 12 October 1916. David Westly Hook died on 1 April 1935 at Hook's Point, Stratford, Hamilton, Iowa, at age 71. Married Name 15 July 1912 As of 15 July 1912,her married name was Sellers. Bertha Canzadia Hook was born on 25 April 1888 at Stratford, Hamilton, Iowa. She was the daughter of David Westly Hook and Elizabeth Mollet. Bertha Canzadia Hook married George W. Sellers on 15 July 1912 at Cedar Rapids, Linn, Iowa. Bertha Canzadia Hook died on 3 October 1945 at Cedar Rapids, Linn, Iowa, at age 57. [S244] U.S. Federal Census 1910 U.S. Federal Census, by Ancestry.com, ED118. Dwelling 1. [S243] U.S. Federal Census 1920 U.S. Federal Census, by Ancestry.com, ED138. Dwelling 38. [S250] U.S. Federal Census 1930 U.S. Federal Census, by Ancestry.com, ED57-68. Dwelling 278. George W. Sellers was born on 1 June 1867 at Tennessee. He married Bertha Canzadia Hook, daughter of David Westly Hook and Elizabeth Mollet, on 15 July 1912 at Cedar Rapids, Linn, Iowa. George W. Sellers died on 28 November 1943 at Iowa at age 76. Married Name 25 November 1908 As of 25 November 1908,her married name was Towlerton. Laura Alice Hook was born on 7 August 1889 at Hamilton, Iowa. Laura Alice Hook married Albert John Towlerton on 25 November 1908 at Webers City, Hamilton, Iowa. Laura Alice Hook died on 29 July 1918 at Cedar Rapids, Linn, Iowa, at age 28. Albert John Towlerton was born on 18 October 1885. He married Laura Alice Hook, daughter of David Westly Hook and Elizabeth Mollet, on 25 November 1908 at Webers City, Hamilton, Iowa. Albert John Towlerton died on 10 November 1935 at Montana at age 50. Name Variation Leroy Albert Hook was also known as Roy A.
Leroy Albert Hook was born on 11 August 1890 at Hamilton, Iowa. He was the son of David Westly Hook and Elizabeth Mollet. Leroy Albert Hook married Lenora C. Johnson on 25 June 1918 at Minneapolis, Hennepin, Minnesota. Leroy Albert Hook died on 8 May 1957 at Iowa at age 66. [S250] U.S. Federal Census 1930 U.S. Federal Census, by Ancestry.com, ED27-318. Dwelling 250. Married Name 25 June 1918 As of 25 June 1918,her married name was Hook. Lenora C. Johnson was born on 28 January 1892. She married Leroy Albert Hook, son of David Westly Hook and Elizabeth Mollet, on 25 June 1918 at Minneapolis, Hennepin, Minnesota. Lenora C. Johnson died in 1975. Name Variation Armilda Isabell Hook was also known as Isabell. Married Name 31 May 1915 As of 31 May 1915,her married name was Geesey. Armilda Isabell Hook was born on 26 September 1896 at Stratford, Hamilton, Iowa. Armilda Isabell Hook married Michael Banks Geesey on 31 May 1915 at Ames, Iowa. Armilda Isabell Hook witnessed the death of Elizabeth Mollet on 17 January 1953 at Cedar Rapids, Linn, Iowa; Mrs. Elizabeth Walstrom, a pioneer settler of Hook's Point and a resident of Stratford for many years, passed away in the home of her daughter, Mrs. M.B. Geesey, at Cedar Rapids, Iowa, Jan. 17, 1953, at 10:55 p.m., at the age of 84 years, 2 months and 13 days. She had been in failing health for some time and submitted to three major operations within the last two years. Regardless of her own misery, she always found time to do for others, and thoughts of others were foremost in her mind. Armilda Isabell Hook died on 1 December 1973 at Cedar Rapids, Linn, Iowa, at age 77. [S250] U.S. Federal Census 1930 U.S. Federal Census, by Ancestry.com, ED57-21. Dwelling 93. Name Variation Michael Banks Geesey was also known as M. B. Name Variation Michael Banks Geesey was also known as Banks. Michael Banks Geesey was born on 25 April 1896 at LeClaire, Scott, Iowa. He married Armilda Isabell Hook, daughter of David Westly Hook and Elizabeth Mollet, on 31 May 1915 at Ames, Iowa. Michael Banks Geesey died on 9 September 1966 at Cedar Rapids, Linn, Iowa, at age 70. Name Variation Jonas H. Walstrom was also known as J. H.
Name Variation Jonas H. Walstrom was also known as Jones. Name Variation Jonas H. Walstrom was also known as John H.
Jonas H. Walstrom was born on 23 February 1859 at Sweden also reported as Feb 1860. He was the son of John E. Walstrom and Hilena Lundgren. Jonas H. Walstrom married Luella Enberg, daughter of George Enberg and Elizabeth Peterson, on 8 June 1884 at Hamilton, Iowa. Jonas H. Walstrom married Elizabeth Mollet, daughter of Joseph Gotthardt Mollet Sr. and Mary Peter, on 4 April 1923. Jonas H. Walstrom died on 14 June 1942 at Stratford, Hamilton, Iowa, at age 83. 1910 Marion, Hamilton, Iowa Jonas H. Walstrom was listed as a son in John E. Walstrom's household on the 1910 Census at Marion, Hamilton, Iowa. 1 January 1925 Stratford, Hamilton, Iowa Jonas H. Walstrom appeared on the census of 1 January 1925 at Stratford, Hamilton, Iowa. Jonas H. Walstrom immigrated with John E. Walstrom and Hilena Lundgren in 1866. [S246] U.S. Federal Census 1880 U.S. Federal Census, by Ancestry.com, Year: 1880; Census Place: Marion, Hamilton, Iowa; Roll: T9_342; Family History Film: 1254342; Page: 262.2000; Enumeration District: 107; Image: 0530.